I am from a New Jersey suburb of Philadelphia. That means that in some ways I both identify with and typify many of the stereotypes associated with this part of the world. For the uninitiated, the general sentiment is that we are somewhat crass people: bold, loud sports fans, fat Italians, too tan, too gaudy, edgy, blue collar. There is a little piece of me in all of those descriptions. I don’t think about it all that much, unless I’m traveling. The differences in my upbringing and lifestyle choices were never more apparent than during my most recent visit to Portland, OR. The thing is, I’m pretty sure everyone that isn’t from Portland might come out of it feeling shell shocked, questioning every life choice they’ve ever made. My boyfriend and I had settled into our hotel downtown and figured we would meander about the city to find a place to eat. Not long into our walk we spotted a man around his forties with long silver hair sitting on the street corner with a small fold up table, pecking away at an old fashioned typewriter. 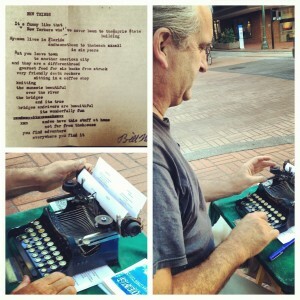 A handwritten sign taped to his table read, “Poems about Anyone or Anything”. I looked at my boyfriend like, there really was no choice in the matter. We get to talking to our newest poet friend, Bill Keys. He likes to get to know his subjects a little before composing his prose. We start telling him about our travels, where we’re from, and how we are eventually headed to a wedding in Hood River. Suddenly I couldn’t help but notice a hipster looking fellow approaching us very intently on his bike. He had all the tell tale signs: he wore tight jean shorts that came down to his knees, Keds, and a look on his face that just screamed, “I listen to The Offspring ironically.” I had been told Portland is something of a Holy Land for hipsters. Hipster guy is keen to talk to Bill. 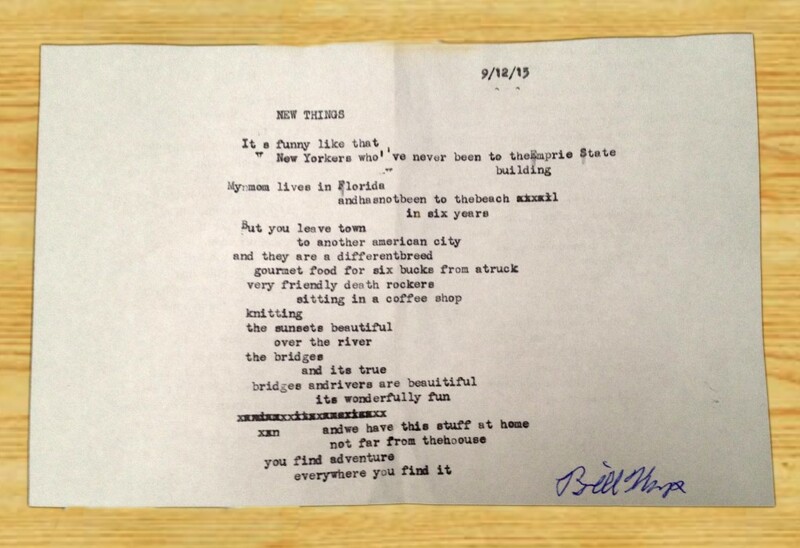 He tells Bill that he has heard of him, and he wanted to connect because his roommate also does an interpretation of street poetry. Hipster guy wanted to try and set up Bill and his roommate in order for them to do some sort of street poetry event together. Hipster guy bought one of the stapled paper poetry books Bill was selling, so he could give it to his roommate. It was just like attending a corporate networking event, except it was Portland so the industry was poetry and the event was on a street corner. To which I interject, “Oh, like bowties with cats on them?” Thinking I knew a few avid Redditors that would appreciate such attire. It was just very much one of those, “We’re not in Philly anymore, Toto” kind of moments. New Yorkers who’ve never been to the Empire State Building. My mom lives in Florida, and has not been to the beach in six years. And they are a different breed. Gourmet food for six bucks from a truck.